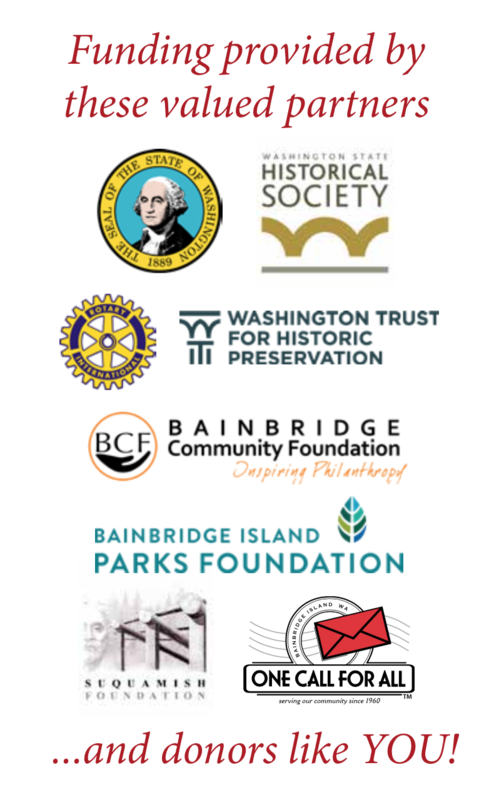 The Fort Ward Community Hall is a collaborative effort of Friends of Fort Ward and the Fort Ward Youth Advisory Committee, the Bainbridge Island Metro Park and Recreation District, Kitsap County (Fort Ward) Sewer District No. 7, and residents of the historic Fort Ward neighborhood on Bainbridge Island, WA. The restoration is now underway, set for completion in spring 2019. The project is being funded through a combination of private donations and historical preservation grants, with our pledge drive now under way – download a pledge form today. We also welcome the participation of local business sponsors to underwrite portions of the project. See our updated Donors List here to see who has already contributed to this great community-driven project. We invite you to join them! Please follow the menu links to read up on the history of the Fort Ward neighborhood and the part it played in our nation’s network of seacoast defenses and wartime codebreaking. We’re proud of our heritage and pleased to share it with you. Check this site and our social media page regularly for updates on the Fort Ward Community Hall project.